According to iResearch, China third-party mobile payment GMV steadily climbed to 1.43 trillion Yuan in Q3 2014, increasing 7.8% versus Q2 2014. The stable growth marks the end of the dramatically surging mobile payment. Mobile payment GMV increased at a stable pace, marking the end of the dramatically surging mobile payment. After experiencing over-100-percent quarterly growth rates from Q3 2013 to Q1 2014, and negative growth in Q2 2014, China third-party mobile payment finally showed stability in Q3 2014. The GMV reached 1.43 trillion Yuan, increasing 7.8% from Q2 2014 and 414.4% compared to Q3 2013. In Q3 2014, the structure of China third-party mobile payment segments became healthier. The once rocketing mobile finance GMV was cooled down by the stable quarterly GMV of money fund. GMV of personal application like transfer and repayment increased steadily with the growing number of mobile Internet users. The growth of mobile payment GMV in Q3 2014 was mainly driven by the growing mobile consumption GMV in mobile e-commerce, mobile group buying and mobile business travel. B2B2C payment companies grew significantly while Alipay had stronger performance. In Q3 2014, Alipay accounted for 82.6% of the third-party mobile payment market by its stable amount of fund subscription and dramatic growth of mobile e-commerce and increasing user base. The bigger market share suggested that Alipay gained a firmer standing in mobile payment. Wechat pay and Mobile QQ pay were the supporting businesses of Tenpay. Due to the surging users and their social payment habit cultivation such as transfer, Tenpay made up 10.0% of mobile payment market, ranking the second place. The performance of some B2B2C payment companies was worth noticing in Q3 2014, including Union Mobile Pay and Lianlianpay. As users are moving from PC to mobile devices to accomplish their payment, the overall GMV of mobile Internet rises quickly. In addition, the rising in-app transactions bring indirect margins to mobile payment companies providing service for business users. 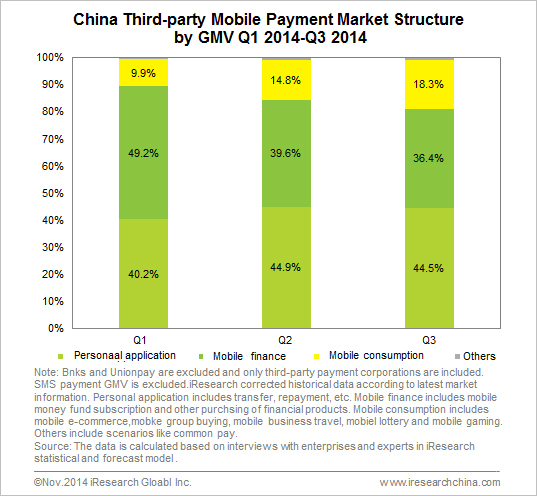 From Q3 2013 to Q3 2014, China third-party mobile payment market structure remained stable. Alipay, Tenpay and Lakala were the Top three companies according to their market share. Specifically, Alipay showed great advantages by maintaining an around-80-percent market share for five quarters which suggested a trend of increase. 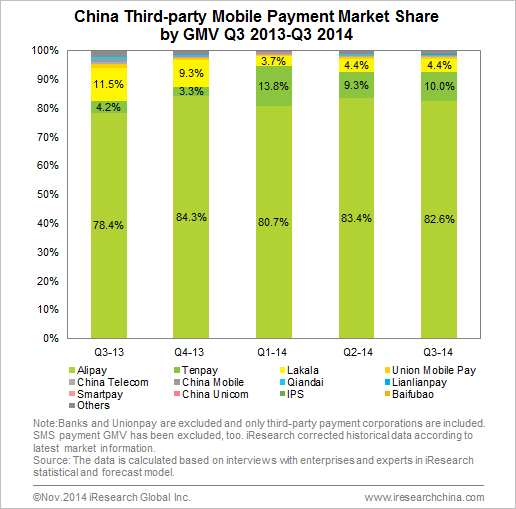 Tenpay claimed a larger market share due to the rising Wechat payment in Q3 2014. Lakala maintained an increasing GMV and its market share stayed stable through 2014. Mobile consumption made up a bigger portion, indicating a healthier structure. In the GMV of China third-party mobile payment in Q3 2014, represented by mobile e-commerce, mobile group buying and mobile business travel, mobile consumption made up a bigger portion and showed a trend of increase. After the volatile first half of 2014, mobile finance GMV increased steadily in Q3 2014, accounting for 35% to 40%. GMV of personal application such as transfer and repayment still kept climbing, occupying around 45%. The rising market share of mobile consumption reduced that of personal application and mobile finance. Thus, they gradually became three key forces in the third-party mobile payment structure. 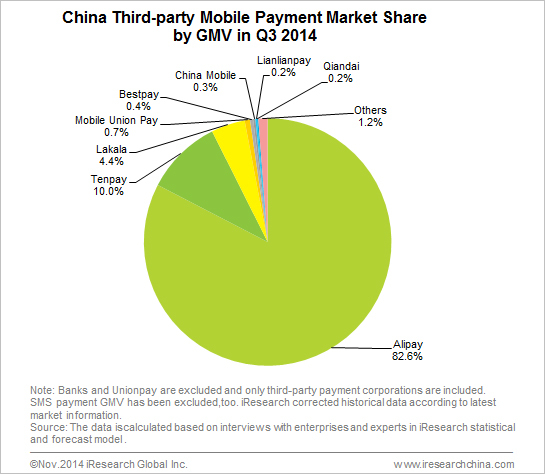 In Q4 2014, it is expected that GMV of China third-party mobile Internet payment will grow steadily. Mobile consumption will be the motivator of quarterly growth. InApp and NFC are payment patterns that should be focused on. Also, payment companies’ competition in O2O and their expansion to offline payment scenarios calls for attention. Mobile consumption GMV like mobile e-commerce will possibly increase because of e-commerce promotions such as “double 11” and “double 12” in the 4th quarter. The increase of e-retailers’ GMV on mobile app will indirectly lead to the growth in the GMV of inApp payment companies. B2B2C payment companies will show promising growth. Mobile phone manufacturers like Apple initiated their mobile payment business, making the NFC market more promising. In the future, other hardware suppliers’ moves in mobile payment are also worthy of attention. Payment’s expansion to offline or O2O scenarios also calls for attention. Mobile payment companies like Lakala mainly concentrate on offline business. Major players’ exploration of mobile payment will influence the mobile payment structure in the future.